Pierre Simon Laplace, the Marquis de Laplace, French mathematician and astronomer, was born at Beaumont-en-Auge in Normandy, on the 28th of March 1749. His father was a small farmer, and he owed his education to the interest excited by his lively parts in some persons of position. His first distinctions are said to have been gained in theological controversy, but at an early age he became mathematical teacher in the military school of Beaumont, the classes of which he had attended as an extern. He was not more than eighteen when, armed with letters of recommendation, he approached Jean le Rond d'Alembert, then at the height of his fame, in the hope of finding a career in Paris. The letters remained unnoticed, but Laplace was not crushed by the rebuff. He wrote to the great geometer a letter on the principles of mechanics, which evoked an immediate and enthusiastic response. "You", said d'Alembert to him, "needed no introduction; you have recommended yourself; my support is your due." He accordingly obtained for him an appointment as professor of mathematics in the École Militaire of Paris, and continued zealously to forward his interests. Laplace had not yet completed his twenty-fourth year when he entered upon the course of discovery which earned him the title of "the Newton of France." Having in his first published paper shown his mastery of analysis, he proceeded to apply its resources to the great outstanding problems in celestial mechanics. Of these the most conspicuous was offered by the opposite inequalities of Jupiter and Saturn, which the emulous efforts of Leonhard Euler and Joseph-Louis Lagrange had failed to bring within the bounds of theory. 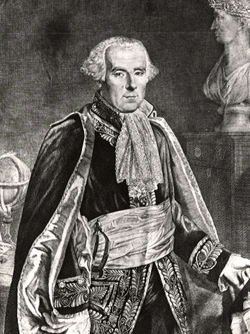 The discordance of their results incited Laplace to a searching examination of the whole subject of planetary perturbations, and his maiden effort was rewarded with a discovery which constituted, when developed and completely demonstrated by his own further labors and those of his illustrious rival Lagrange, the most important advance made in physical astronomy since the time of Newton. In a paper read before the Academy of Sciences, on the 10th of February 1773, Laplace announced his celebrated conclusion of the invariability of planetary mean motions, carrying the proof as far as the cubes of the eccentricities and inclinations. This was the first and most important step in the establishment of the stability of the solar system. It was followed by a series of profound investigations, in which Lagrange and Laplace alternately surpassed and supplemented each other in assigning limits of variation to the several elements of the planetary orbits. The analytical tournament closed with the communication to the Academy by Laplace, in 1787, of an entire group of remarkable discoveries. It would be difficult, in the whole range of scientific literature, to point to a memoir of equal brilliancy with that published (divided into three parts) in the volumes of the Academy for 1784, 1785 and 1786. The long-sought cause of the "great inequality" of Jupiter and Saturn was found in the near approach to commensurability of their mean motions; it was demonstrated in two elegant theorems, independently of any except the most general considerations as to mass, that the mutual action of the planets could never largely affect the eccentricities and inclinations of their orbits; and the singular peculiarities detected by him in the Jovian system were expressed in the so-called "laws of Laplace." He completed the theory of these bodies in a treatise published among the Paris Memoirs for 1788 and 1789; and the striking superiority of the tables computed by Delambre from the data there supplied marked the profit derived from the investigation by practical astronomy. The year 1787 was rendered further memorable by Laplace's announcement on the 19th of November (Memoirs, 1786), of the dependence of lunar acceleration upon the secular changes in the eccentricity of the earth's orbit. The last apparent anomaly, and the last threat of instability, thus disappeared from the solar system. With these brilliant performances the first period of Laplace's scientific career may be said to have closed. If he ceased to make striking discoveries in celestial mechanics, it was rather their subject matter than his powers that failed. The general working of the great machine was now laid bare, and it needed a further advance of knowledge to bring a fresh set of problems within reach of investigation. The time had come when the results obtained in the development and application of the law of gravitation by three generations of illustrious mathematicians might be presented from a single point of view. To this task the second period of Laplace's activity was devoted. As a monument of mathematical genius applied to the celestial revolutions, the Mécanique céleste ranks second only to the Principia of Newton. The declared aim of the author was to offer a complete solution of the great mechanical problem presented by the solar system, and to bring theory to coincide so closely with observation that empirical equations should no longer find a place in astronomical tables. His success in both respects fell little short of his lofty ideal. The first part of the work (2 volumes 4to, Paris, 1799) contains methods for calculating the movements of translation and rotation of the heavenly bodies, for determining their figures, and resolving tidal problems; the second, especially dedicated to the improvement of tables, exhibits in the third and fourth volumes (1802 and 1805) the application of these formulae; while a fifth volume, published in three installments, 1823-25, comprises the results of Laplace's latest researches, together with a valuable history of progress in each separate branch of his subject. In the delicate task of apportioning his own large share of merit, he certainly does not err on the side of modesty; but it would perhaps be as difficult to produce an instance of injustice, as of generosity in his estimate of others. Far more serious blame attaches to his all but total suppression in the body of the work -- and the fault pervades the whole of his writings -- of the names of his predecessors and contemporaries. Theorems and formulae are appropriated wholesale without acknowledgment, and a production which may be described as the organized result of a century of patient toil presents itself to the world as the offspring of a single brain. The Mécanique céleste is, even to those most conversant with analytical methods, by no means easy reading. Jean-Baptiste Biot, who assisted in the correction of its proof sheets, remarked that it would have extended, had the demonstrations been fully developed, to eight or ten instead of five volumes; and he saw at times the author himself obliged to devote an hour's labor to recovering the dropped links in the chain of reasoning covered by the recurring formula. "Il est aisé à voir." The Exposition du système du monde (Paris, 1796) has been styled by François Arago "the Mécanique céleste disembarrassed of its analytical paraphernalia. Conclusions are not merely stated in it, but the methods pursued for their attainment are indicated. It has the strength of an analytical treatise, the charm of a popular dissertation. The style is lucid and masterly, and the summary of astronomical history with which it terminates has been reckoned one of the masterpieces of the language. To this linguistic excellence the writer owed the place accorded to him in 1816 in the Academy, of which institution he became president in the following year. The famous "nebular hypothesis" of Laplace made its appearance in the Système du monde. Although relegated to a note (vii. ), and propounded "Avec la défiance que doit inspirer tout ce qui n'est point un résultat de l'observation ou du calcul", it is plain, from the complacency with which he recurred to it at a later date, that he regarded the speculation with considerable interest. That it formed the starting point, and largely prescribed the course of thought on the subject of planetary origin is due to the simplicity of its assumptions, and the clearness of the mechanical principles involved, rather than to any cogent evidence of its truth. It is curious that Laplace, while bestowing more attention than they deserved on the crude conjectures of Buffon, seems to have been unaware that he had been, to some extent, anticipated by Kant, who had put forward in 1755, in his Allgemeine Naturgeschichte, a true though defective nebular cosmogony. The career of Laplace was one of scarcely interrupted prosperity. Admitted to the Academy of Sciences as an associate in 1773, he became a member in 1785, having, about a year previously, succeeded E. Bezout as examiner to the royal artillery. During an access of revolutionary suspicion, he was removed from the commission of weights and measures; but the slight was quickly effaced by new honors. He was one of the first members, and became president of the Bureau of Longitudes, took a prominent place at the Institute (founded in 1796), professed analysis at the École Normale, and aided in the organization of the decimal system. The publication of the Mécanique céleste gained him worldwide celebrity, and his name appeared on the lists of the principal scientific associations of Europe, including the Royal Society. But scientific distinctions by no means satisfied his ambition. He aspired to the role of a politician, and has left a memorable example of genius degraded to servility for the sake of a riband and a title. The ardor of his republican principles gave place, after the 18th Brumaire, to devotion towards the first consul, a sentiment promptly rewarded with the post of minister of the interior. His incapacity for affairs was, however, so flagrant that it became necessary to supersede him at the end of six weeks, when Lucien Bonaparte became his successor. "He brought into the administration", said Napoleon, "the spirit of the infinitesimals." His failure was consoled by elevation to the senate, of which body he became chancellor in September 1803. He was at the same time named grand officer of the Legion of Honor, and obtained in 1813 the same rank in the new order of Reunion. The title of count he had acquired on the creation of the empire. Nevertheless he cheerfully gave his voice in 1814 for the dethronement of his patron, and his "suppleness" merited a seat in the chamber of peers, and, in 1817, the dignity of a marquisate. The memory of these tergiversations is perpetuated in his writings. The first edition of the Système du monde was inscribed to the Council of Five Hundred; to the third volume of the Mécanique céleste (1802) was prefixed the declaration that, of all the truths contained in the work, that most precious to the author was the expression of his gratitude and devotion towards the "pacificator of Europe"; upon which noteworthy protestation the suppression in the editions of the Théorie des probabilités subsequent to the restoration, of the original dedication to the emperor formed a fitting commentary. During the later years of his life, Laplace lived much at Arcueil, where he had a country-place adjoining that of his friend Claude-Louis Berthollet. With his cooperation the Socité d'Arcueil was formed, and he occasionally contributed to its Memoirs. In this peaceful retirement he pursued his studies with unabated ardor, and received with uniform courtesy distinguished visitors from all parts of the world. Here, too, he died, attended by his physician, Dr. Majendie, and his mathematical coadjutor, Alexis Bouvard, on the 5th of March 1827. His last words were: "Ce que nous connaissons est peu de chose, ce que nous ignorons est immense." Expressions occur in Laplace's private letters inconsistent with the atheistical opinions he is commonly believed to have held. His character, notwithstanding the egotism by which it was disfigured, had an amiable and engaging side. Young men of science found in him an active benefactor. His relations with these "adopted children of his thought" possessed a singular charm of affectionate simplicity; their intellectual progress and material interests were objects of equal solicitude to him, and he demanded in return only diligence in the pursuit of knowledge. Biot relates that, when he himself was beginning his career, Laplace introduced him at the Institute for the purpose of explaining his supposed discovery of equations of mixed differences, and afterwards showed him, under a strict pledge of secrecy, the papers, then yellow with age, in which he had long before obtained the same results. This instance of abnegation is the more worthy of record that it formed a marked exception to Laplace's usual course. Between him and Adrien-Marie Legendre there was a feeling of "more than coldness", owing to his appropriation, with scant acknowledgment, of the fruits of the other's labors; and Dr. Thomas Young counted himself, rightly or wrongly, among the number of those similarly aggrieved by him. With Lagrange, on the other hand, he always remained on the best of terms. Laplace left a son, Charles Emile Pierre Joseph Laplace, who succeeded to his title, and rose to the rank of general in the artillery. It might be said that Laplace was a great mathematician by the original structure of his mind, and became a great discoverer through the sentiment which animated it. The regulated enthusiasm with which he regarded the system of nature was with him from first to last. It can be traced in his earliest essay, and it dictated the ravings of his final illness. By it his extraordinary analytical powers became strictly subordinated to physical investigations. To this lofty quality of intellect he added a rare sagacity in perceiving analogies, and in detecting the new truths that lay concealed in his formulae, and a tenacity of mental grip, by which problems, once seized, were held fast, year after year, until they yielded up their solutions. In every branch of physical astronomy, accordingly, deep traces of his work are visible. "He would have completed the science of the skies", Fourier remarked, "had the science been capable of completion." It may be added that he first examined the conditions of stability of the system formed by Saturn's rings, pointed out the necessity for their rotation, and fixed for it a period (in 10h 33m) virtually identical with that established by the observations of John Herschel; that he detected the existence in the solar system of an invariable plane such that the sum of the products of the planetary masses by the projections upon it of the areas described by their radii vectors in a given time is a maximum; and made notable advances in the theory of astronomical refraction, besides constructing satisfactory formulae for the barometric determination of heights. His removal of the considerable discrepancy between the actual and Newtonian velocities of sound, by taking into account the increase of elasticity due to the heat of compression, would alone have sufficed to illustrate a lesser name. Molecular physics also attracted his notice, and he announced in 1824 his purpose of treating the subject in a separate work. With Lavoisier he made an important series of experiments on specific heat (1782-84), in the course of which the "ice calorimeter" was invented; and they contributed jointly to the Memoirs of the Academy (1781) a paper on the development of electricity by evaporation. Laplace was, moreover, the first to offer a complete analysis of capillary action based upon a definite hypothesis -- that of forces "sensible only at insensible distances"; and he made strenuous but unsuccessful efforts to explain the phenomena of light on an identical principle. It was a favorite idea of his that chemical affinity and capillary attraction would eventually be included under the same law, and it was perhaps because of its recalcitrance to this cherished generalization that the undulatory theory of light was distasteful to him. The investigation of the figure of equilibrium of a rotating fluid mass engaged the persistent attention of Laplace. His first memoir was communicated to the Academy in 1773, when he was only twenty-four, his last in 1817, when he was sixty-eight. The results of his many papers on this subject -- characterized by him as "un des points les plus intéressans du système du monde" -- are embodied in the Mécanique céleste, and furnish one of the most remarkable proofs of his analytical genius. Colin Maclaurin, Legendre and d'Alembert had furnished partial solutions of the problem, confining their attention to the possible figures which would satisfy the conditions of equilibrium. Laplace treated the subject from the point of view of the gradual aggregation and cooling of a mass of matter, and demonstrated that the form which such a mass would ultimately assume must be an ellipsoid of revolution whose equator was determined by the primitive plane of maximum areas. The related subject of the attraction of spheroids was also signally promoted by him. Legendre, in 1783, extended Maclaurin's theorem concerning ellipsoids of revolution to the case of any spheroid of revolution where the attracted point, instead of being limited to the axis or equator, occupied any position in space; and Laplace, in his treatise Théorie du mouvement et de la figure elliptique des planètes (published in 1784), effected a still further generalization by proving, what had been suspected by Legendre, that the theorem was equally true for any confocal ellipsoids. Finally, in a celebrated memoir, Théorie des attractions des sphéroides et de la figure des planètes, published in 1785 among the Paris Memoirs for the year 1782, although written after the treatise of 1784, Laplace treated exhaustively the general problem of the attraction of any spheroid upon a particle situated outside or upon its surface. These researches derive additional importance from having introduced two powerful engines of analysis for the treatment of physical problems, Laplace's coefficients and the potential function. By his discovery that the attracting force in any direction of a mass upon a particle could be obtained by the direct process of differentiating a single function, Laplace laid the foundations of the mathematical sciences of heat, electricity and magnetism. The expressions designated by Dr. Whewell, Laplace's coefficients were definitely introduced in the memoir of 1785 on attractions above referred to. In the figure of the earth, the theory of attractions, and the sciences of electricity and magnetism this powerful calculus occupies a prominent place. Carl Friedrich Gauss in particular employed it in the calculation of the magnetic potential of the earth, and it received new light from James Clerk Maxwell's interpretation of harmonics with reference to poles on the sphere. Laplace nowhere displayed the massiveness of his genius more conspicuously than in the theory of probabilities. The science which Blaise Pascal and Pierre de Fermat had initiated he brought very nearly to perfection; but the demonstrations are so involved, and the omissions in the chain of reasoning so frequent, that the Théorie analytique (1812) is to the best mathematician's a work requiring most arduous study. The theory of probabilities, which Laplace described as common sense expressed in mathematical language, engaged his attention from its importance in physics and astronomy; and he applied his theory, not only to the ordinary problems of chances, but also to the inquiry into the causes of phenomena, vital statistics and future events. The device known as the method of least squares, for reducing numerous equations of condition to the number of unknown quantities to be determined, had been adopted as a practically convenient rule by Gauss and Legendre; but Laplace first treated it as a problem in probabilities, and proved by an intricate and difficult course of reasoning that it was also the most advantageous, the mean of the probabilities of error in the determination of the elements being thereby reduced to a minimum. Laplace published in 1779 the method of generating functions, the foundation of his theory of probabilities, and the first part of his Théorie analytique is devoted to the exposition of its principles, which in their simplest form consist in treating the successive values of any function as the coefficients in the expansion of another function with reference to a different variable. The latter is therefore called the generating function of the former. A direct and an inverse calculus is thus created, the object of the former being to determine the coefficients from the generating function, of the latter to discover the generating function from the coefficients. The one is a problem of interpolation, the other a step towards the solution of an equation in finite differences. The method, however, is now obsolete owing to the more extended facilities afforded by the calculus of operations. The first formal proof of Lagrange's theorem for the development in a series of an implicit function was furnished by Laplace, who gave to it an extended generality. He also showed that every equation of an even degree must have at least one real quadratic factor, reduced the solution of linear differential equations to definite integrals, and furnished an elegant method by which the linear partial differential equation of the second order might be solved. He was also the first to consider the difficult problems involved in equations of mixed differences, and to prove that an equation in finite differences of the first degree and the second order might always be converted into a continued fraction. In 1842, the works of Laplace being nearly out of print, his widow was about to sell a farm to procure funds for a new impression, when the government of Louis-Philippe took the matter in hand. A grant of 40,000 francs having been obtained from the chamber, a national edition was issued in seven 4to volumes, bearing the title Oeuvres de Laplace (1843-47). The Mécanique céleste with its four supplements occupies the first 5 volumes, the 6th contains the Système du monde, and the 7th the Théorie des probabilités, to which the more popular Essai philosophique forms an introduction. Of the four supplements added by the author (1816-25) he tells us that the problems in the last were contributed by his son. An enumeration of Laplace's memoirs and papers (about one hundred in number) is rendered superfluous by their embodiment in his principal works. The Probabilités was first published in 1812, the Essai in 1814; and both works as well as the Système du monde went through repeated editions. An English version of the Essai appeared in New York in 1902. Laplace's first separate work, Théorie du mouvement et de la figure elliptique des planètes (1784), was published at the expense of President Bochard de Saron. The Précis de l'histoire de l'astronomie (1821), formed the fifth book of the 5th edition of the Système du monde. An English translation, with copious elucidatory notes, of the first 4 volumes of the Mécanique céleste, by Nathaniel Bowditch, was published at Boston (1829-39), in 4 vols. 4to. ; a compendium of certain portions of the same work by Mrs. Somerville appeared in 1831, and a German version of the first 2 volumes by Burckhardt at Berlin in 1801. English translations of the Système du monde by J. Pond and H. H. Harte were published, the first in 1809, the second in 1830.